Christmas is a great time of the year for we celebrate the coming the Lord Jesus Christ. Regardless of our personal situation at this time, if we are Christians, we can rejoice that the Saviour and King has come and is reigning in our lives and the world. Let's look for a moment at the cost of Christmas on the human level. 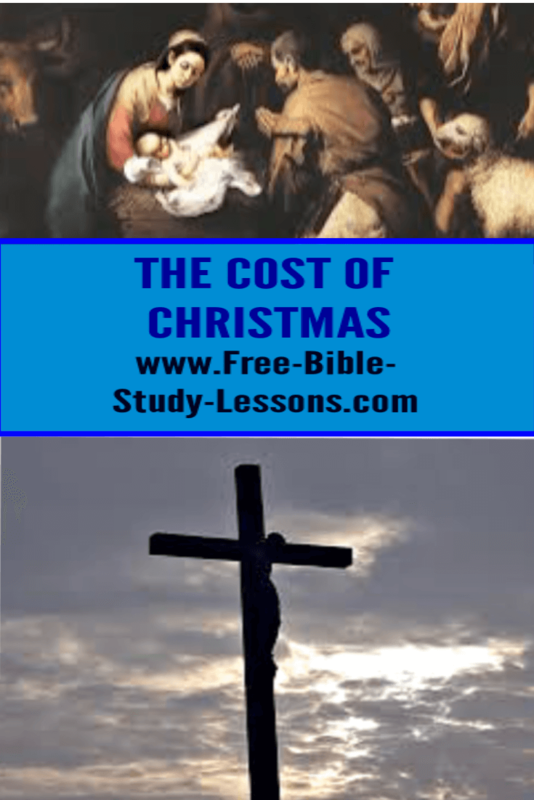 Of course, we know it cost God the Father His only begotten Son and we know it cost Jesus the pleasures of heaven to come to a sin-filled earth, but what about Mary and Joseph? Mary was a young girl committed to be married to Joseph. What excitement she must have felt when she realized she was the one who was going to give birth to the Messiah - the hope of every Jewish girl down through the centuries. It was her! She was the one! Wow! Who did she tell first? Did she wait until after spending three months with Elizabeth to tell her loved husband-to-be? We don't know, but what heart-break when she did tell him and he didn't believe her! The man of her dreams instead believes [most naturally] that she has been sexually involved with another man. Their marriage is going to be off. All her plans and hopes for the future seem cut off. Her friends and family shun her as a "loose" woman. All through her life the majority of people [outside the faith] believed her to have committed a great sin against God. ...and not only was she perfectly innocent, but she had been greatly honoured in God's sight. God sees things differently. He knows the truth. Honour with God does not necessarily mean honour with men. But which is more important? Mary paid the cost of Christmas all her life. Joseph was a man who loved God with all his heart. How his heart shattered when his greatly-loved wife-to-be broke the news to him that she was pregnant. He knew he was innocent - and the story she told was silly to the point of being sacrilegious. He was a man of principle, committed to God and realized he could not marry someone involved in such sin [especially when instead of confessing it she tried to cover it up with an unbelievable story]. His plans and hopes for the future seem dashed. And yet he was a man of compassion. He did not want to take revenge on Mary for her supposed unfaithfulness, but he wanted to end this quietly and discretely. He was going to follow God no matter what anyone else did. Of course, we know God revealed the truth to Joseph and he then accepted Mary. But to the outside world by doing that he was admitting that he was the father. So Mary and Joseph, although perfectly innocent, had their reputations ruined. Undoubtedly it cost them friendships and probably business. If they were now to look back over the cost of Christmas, would they say it was worth it? Yes, a thousand times, yes! The benefits of God moving in our lives and using us always far out-weighs the cost - but make no mistake - there is always a cost of Christmas. If you're feeling joyful this Christmas season. Great! Rejoice, but remember there was a price to pay for the joy of that new-born Babe Who would take away the sins of the world. Are you feeling lonely or discouraged at this season? Be encouraged. God knows your pain but, like Mary and Joseph, if you are willing to continue in the path He leads you, He will turn your pain into joy. Turn your eyes to Jesus and use Christmas as a time to minister to others and watch what God will do! If you do not know Jesus as Lord and Saviour, will you pay the cost of Christmas to experience the new life of Christ in you?